Josephine is a young woman with brown hair and dark eyes. She is seen wearing a blue business blazer. 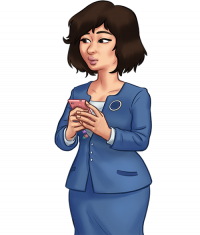 Josephine is a lethargic employee, and holds a certain animosity towards her father Mr. Sato. She is willing to break work policies just to spite him. Josephine works as a desk clerk at SAGA, her father's car dealership. Josephine agrees to help you with Debbie's car. But everything has a price sooner or later! This page was last edited on 2 April 2019, at 01:18.